OSWEGO, NY – Stephen Auyer and Kaitlyn Armstrong gave their varsity soccer teams victories over Rome Free Academy as the Bucs won two games on Monday. 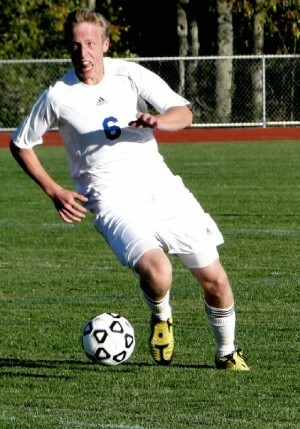 Stephen Auyer scored three goals enroute to a 3-1 win over RFA on Monday. Both teams had lost numerous graduates, but Oswego and Rome Free squared off on the soccer field at the Oswego Middle School on Monday with the Bucs rallying for the victory. 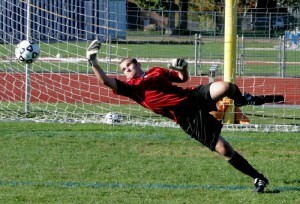 Rome scored just nine minutes into the game as a scoring play developed quickly as Jake Pohl connected on a long-range shot to beat Oswego keeper Matt Skinner. However, it was the final goal that Skinner would surrender. The Bucs had several first half opportunities, but could not finish. However, in the second half senior Stephen Auyer scored all three goals for the Bucs as they won their second game of the season. Back to back goals within nearly a minute of one another put the Bucs in a 2-1 lead from a 1-0 deficit. Auyer also scored just past the midway point of the second half for his final tally of the day. Skinner finished with seven saves for the Bucs. The Lady Bucs made the long trip to Rome and escaped with a 1-0 win. After an ugly first half in which Oswego did not generate a shot on goal, they settled down and played a better second half. With 16 minutes left in the game They earned their first and only corner kick. MacKenzie Palmer crossed a nice ball to the near post and Kayla Sharkey dummied the ball, which got to Kaitlyn Armstrong on the back post who hammered it into upper right side for the lone goal of the game. The defense played a strong game and Jamie Bouffard was great in net making 14 saves to preserve the shutout. The Bucs are 3-3 on the year and go to Red Creek for a 7 p.m. start on Friday.